This symbol depicts two fish linked together. 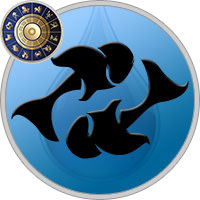 The symbol itself expresses an inherent duality that many Pisces experience. Pisces is a sign that is constantly "in-between". They straddle two different worlds. Meaning, they could be flopping between the realm of life vs. death, physical vs. spiritual, dream vs. reality. The connecting line between the two fish symbols indicates Pisces link between two worlds. In essence, Pisces is the liaison, or mediator. They can walk in two worlds easily. The glyph also represents two crescent moons, and the line between indicates the constancy of lunar cycles. Pisces can relate to this symbolic concept. This zodiac sign inherently understands the cycles of time, life and death, etc. 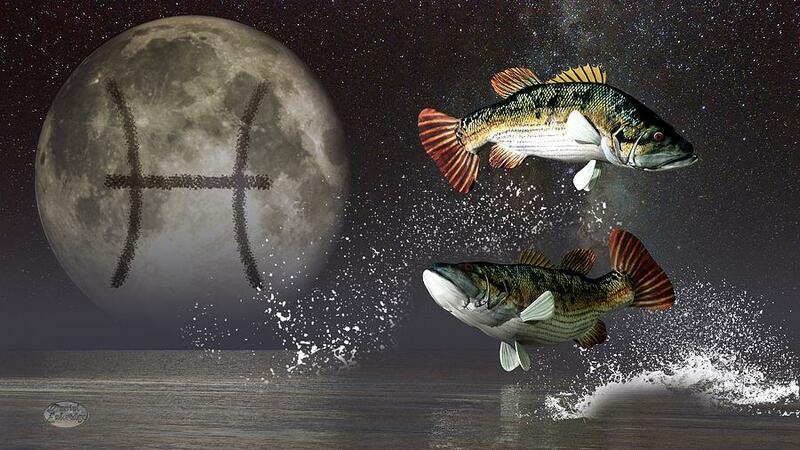 The moon is symbolic of transition in life - an understanding most Pisces easily pick up on. Water: The element water holds different symbolic connection for different signs. In Pisces case, water is symbolic of this sign’s ability to dive deep under the currents of emotion and intuition. Pisces has a uncanny ability to submerge themselves beneath the surface of everyday, common life. When they swim under that surface, they discover the foundations that makes stuff work. Like ulterior motives in others, secret desires, reasons for behavior. But that’s not all, they also see deeply into the spirit world. In essence, Pisces’ ability to go deep allows them to peel back the layers of common reality - exposing them to a whole new world of existence. Water also holds a theme of healing for Pisces. By their nature, most Pisces are genuinely compassionate, and have an inherent need to help those in need. Their governing element of water allows them to flow in people and places to offer cleansing, healing energy. Water Lily: There is, perhaps, no greater symbol that captures Pisces personality in the botanical world than the water lily. Water lilies elegantly float upon the surface of the water, while their roots reach deep under their aquatic surfaces. This is a beautiful illustration of Pisces. These signs can potentially live effectively in two different worlds and thrive. A healthy, whole Pisces can love, express, function gloriously within this world. Simultaneously, they can be rooted in an entirely different world... a world of their own understanding... a world of their own design, even. In so doing, Pisces can pull nutrients from the world of spirit, magic and wonder. These mystical nutrients move up through a Pisces energy system, and surfaces out to their communities, families, work places. The effect is magnificent. Pisces has the unique ability to draw wisdom from far-out sources and then share this otherworldly wisdom with the world. The water lily is a reminder to all Pisces of this remarkable gift. Aquamarine: This gemstone has a few symbolic angles that jive with Pisces. Firstly, it’s a beryl, which is comprised of hexagonal crystals. Hexagons are six sided. Big deal, right? Well it is, because the number six is symbolic of love, unity, harmony. Six is ruled by Venus, the goddess of compassion, healing and of course, love. So, for Pisces, the structural make-up of aquamarine expresses the vibration of love. In other words, this stone both meshes and enhances Pisces’ ability to reflect benevolence in their daily activities. Secondly, aquamarine gets its colors from impurities in their environment. In the same way, some of the most powerfully psychic Pisces get their power from conflicts they’ve had to endure in their lives. In other words, Pisces who exhibit the most robust and dynamic gifts of their sign, have typically had to deal with some kind of trauma(s). In essence, like aquamarine, Pisces are able to shine, glitter and express their divine colorful selves by filtering through impurities in their life experience. Twin Fish: The most interesting correlation between Pisces and their symbol, the fish, is the aspect of sensory perception. Think on it...fish exist 100% by their senses. They don’t have Google to tell them about their environment like we do. Some fish, like the blind cavefish exist in a complete state of sensory perception - they can’t even see what’s around them! I’d like to encourage Pisces to allow the blind cavefish to be their mentor. A truly switched on Pisces can move through this world completely unphased by physical reality. Rather, they can move through life deftly, using their own unique and powerful perception. Fish are extremely sensitive, as are Pisces. The fish reminds Pisces that being submerged in their own world can work to their advantage.